Our Ride-A-Rescue horseback riding program was started to help support our rescue horses as part of their rehabilitation. 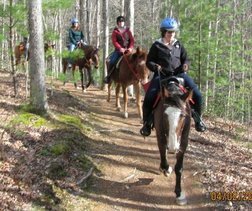 Ride-A-Rescue trail rides use only healthy, rested rescue horses eager and ready to work. This program is designed to be a fun community activity that provides our rescues with a job and sense of purpose! We specialize in beginners of all ages, and welcome the opportunity to teach and educate everyone who participates in our Ride-A-Rescue trail rides. We operate year round on weekdays and weekends, and trail rides range from 1-4 hours in duration. Let us know if you want to ride, and we'll get you out on horseback! you'll pass through landscapes of dense forest to windswept ridge tops. In the Spring you'll enjoy the abundant blooms of native rhododendron, and lush green rolling hills in the summer. Revel in the vibrant colors of the Fall, or enjoy the extraordinary views of unique to winter riding. Our trails range from mountaintop pastures to hill side views along the wonderful New River. All trail rides are guided, and the cost is $35/hour. No experience is necessary- we have a horse for everyone! The horses we use for trail rides are gentle and calm, and we provide all riders with a five-minute "lesson" to show them the ropes. Because our rescue is 100% volunteer operated, we ask that you schedule your trail rides one week in advance. This allows us time to coordinate with our volunteer staff to ensure that you have ample guidance and assistance on the trails.